In this second part of my series on BackgroundWorkers in Smart Office Scripts, I illustrate how to disable/enable the user interface, how to indicate activity, and how to show progress, because good usability is important to me. This article is a continuation of my previous article, Part 1. When I put a time-consuming operation in a background thread, the user interface remains available to the user and I must take special consideration when crafting the code. First, I want to disable part of the user interface so the user doesn’t start the time-consuming operation again, or that would have unexpected results. Also, I want to indicate activity so the user knows the time-consuming operation is in progress. Also, I want to show progress – 10%, 20%, 30%…100% – so the user knows where the processing is at. I address these special considerations because good usability is important to me. In some cases, I want to disable part of the user interface so the user doesn’t start the time-consuming operation again. 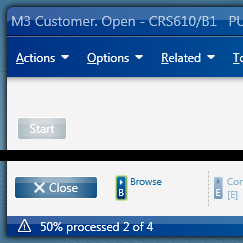 Starting the time-consuming operation twice could have unexpected results, for example duplicate requests to the server could result in duplicate Customer Orders in M3; it depends on what the script does. 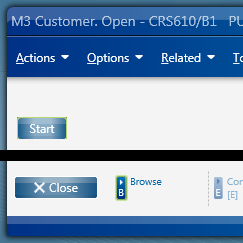 If the BackgroundWorker was started from a button I want to disable that button. But if the script was started from a Smart Office Shortcut (Tools > Personalize > Shortcuts) I would have to implement some kind of semaphore to not start the time-consuming operation again; that code is not shown here. Finally, after the time-consuming operation is finished I enable the button back to its former state. Also, I can only disable/enable the user interface in the UI thread, not in the background thread as that would throw an Exception. 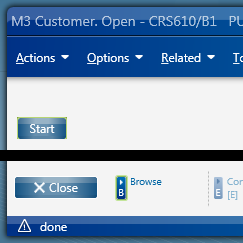 Note that if multiple BackgroundWorkers were running in parallel, I would need to enable the user interface only after the last worker has completed; that code is not shown here. I want to indicate activity so the user knows the time-consuming operation is in progress and doesn’t start it again. Similarly, I can only indicate activity in the UI thread, not in the background thread as that would throw an Exception. There are multiple techniques to indicate activity. Another technique is to show an animated icon. Another technique is to add a Label to the user interface and set it to whatever text I want. I want to show progress when I have multiple time-consuming operations so the user knows where the processing is at. For example, if I was processing a shopping cart from the script (in a parallel universe where shopping carts are processed on the client-side) I would want to call various transactions from OIS100MI: first AddBatchHead, then various AddBatchLine, and finally Confirm, and I would want the user to know what the progress is. So, supposing I have N requests, I want to show the progress i of N.
Similarly, I can only show progress in the UI thread, not in the background thread as that would throw an Exception. That code was tested in Smart Office 10.0.4.0.38. In this article I illustrated how to disable/enable the user interface, how to indicate activity, and how to show progress when using BackgroundWorkers in Smart Office Scripts because good usability is important to me. Awesome. A must have BackgroundWorker example. Thanks Thibaud. Gracias por el feedback Juan!